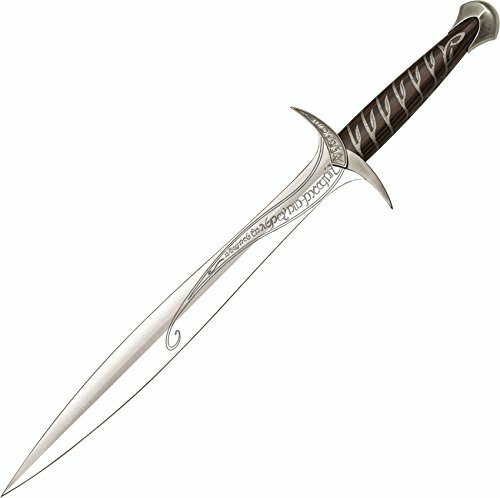 The epic trilogy The Lord of the Rings yields this officially licensed reproduction sword. This is Sting, the magical sword carried by Frodo Baggins on his quest through Middle Earth. Measuring 22-Inch overall, the sword features a 15-Inch blade constructed from AUS-6 stainless steel, hardwood hand grip with Elven vine design, and a solid metal guard and pommel with antique metal finish. Engraved on the blade and cross guard are runes in the Elven language of Sindarin that say "Maegnas is my name, I am the spider's bane". Includes display plaque with wood grain finish and Elven rune silk screen. This authentically detailed replica is a reproduction of the actual filming prop built by Weta Workshop of New Zealand and used in the motion picture triology, The Lord of The Rings. United Cutlery, industry leader in fine movie reproductions, has meticulously recreated the prop using only the finest grade materials and craftsmanship. Close attention to detail was a top priority. It is presented with a wood wall display and includes a certificate of authenticity.